Sometimes baking out of necessity leave you with the most surprising of good results. Key word “sometimes”. This time was one of those times. I knew I had some ingredients on hand and needed to use my homemade pumpkin puree so I created this tasty, savory breakfast option for my mornings. I try not to start of my day plummeting into sugar, my and most Americans’ drug of choice. It doesn’t help that I’ve recently watched 3 documentaries back-to-back on the sugar industry and hidden sugars in our food supply. In case you’re wondering, yes, it’s terrifying. This rainy Monday morning was the perfect opportunity to make these happen. Fun fact: the kitchen is my favorite shelter to ride out a storm. I have not started a family of my own as of yet and the family I grew up in lives far away from me. So when I cook, it’s usually either just for me, small gatherings, to meet an immediate food craving or to plan out for the work week. I wanted a low sugar breakfast that would still leave me satisfied and full. Naturally I went to whole grains and then my mind wandered through all of the delicious things I could make to muffins. This batch makes just enough, especially since I don’t like to keep baked goods around in the house, the temptation is too strong, but this could easily be doubled or tripled. It’s not often that muffins grace the counter of my home but after making these, that may be changing. I love the warm, spicy flavors from the curry and ginger that meld with the turmeric and cinnamon. I wanted to bulk up the nutrition a bit with some garbanzo bean flour. This flour, made from chickpeas, is naturally gluten free and has a lovely texture, especially when baked. I found it fitting since this is a curry muffin. GB flour is full of vitamins and minerals like iron, vitamin B6 , magnesium and also has a good amount of fiber and protein to help you keep those pesky hunger pains away. Since it is autumn, pumpkin and all of the other delicious harvest vegetables and fruits are in season. This is my favorite season and has my favorite flavors and ingredients. 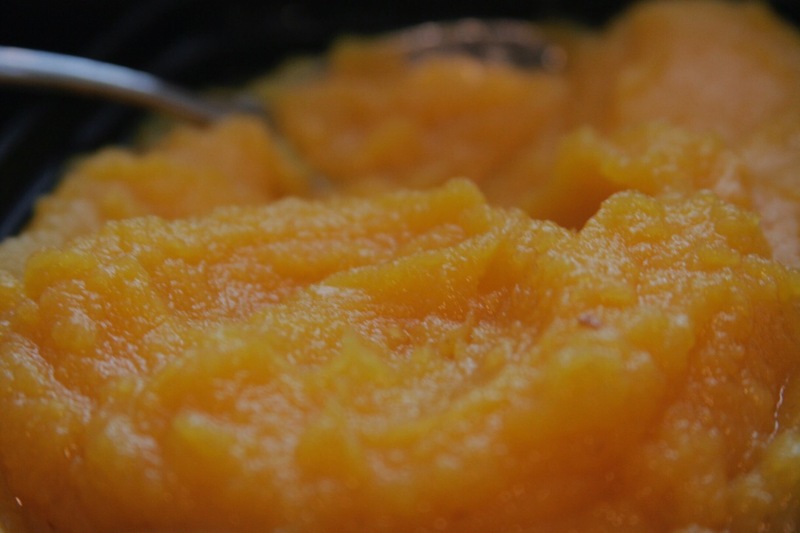 It is so easy to grab a can of pumpkin puree and never get your hands dirty, but making your own, fresh pumpkin puree is actually surprisingly easy and can be fun, too. 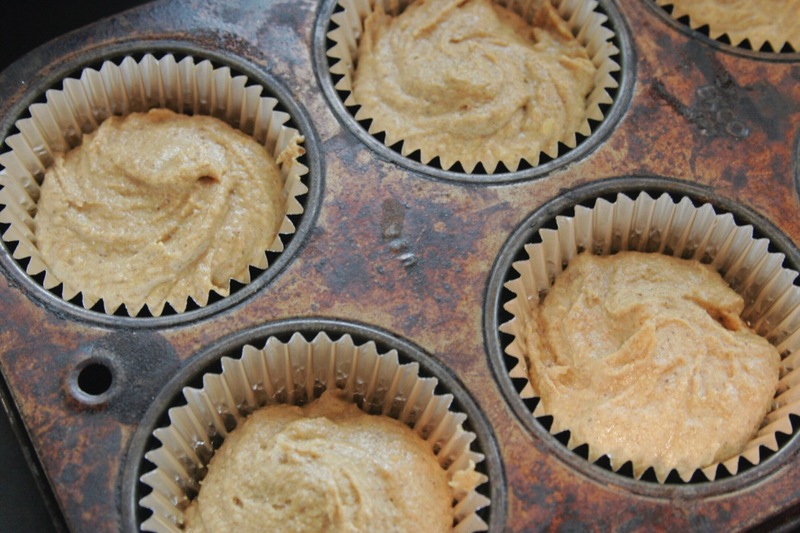 It’s also a great way to ensure a preservative free, all-natural, fresh pumpkin flavor. Recipe posted at the bottom of the page. If you can’t make your own, don’t worry, the canned stuff would work just fine, too. Just try to find something organic and natural. Preheat oven to 350 Fahrenheit. Line muffin tin with 6 liners and set aside. Heat a medium skillet over medium low heat. Mix together all purpose flour, garbanzo bean flour, curry powder, ground ginger, and ground turmeric in a small bowl. Add the flour mixture to the pre-heated skillet and toast for 10-15 minutes stirring frequently. Make sure you keep it moving in the pan so that the mixture does not burn but slowly toasts. You will notice the flour begin to change slowly to a light brown, toasty color and the aromas of the spices will begin to become more fragrant. Remove from skillet to cool in the same small bowl. In a large mixing bowl mix the ground cinnamon, baking powder, baking soda and salt. Add the cooled flour mixture to the other dry ingredients and mix to incorporate. Then add the egg, pumpkin puree, coconut milk and coconut oil and stir until just fully combined, careful not to over mix. Immediately scoop the prepared batter evenly amongst the 6 liners. 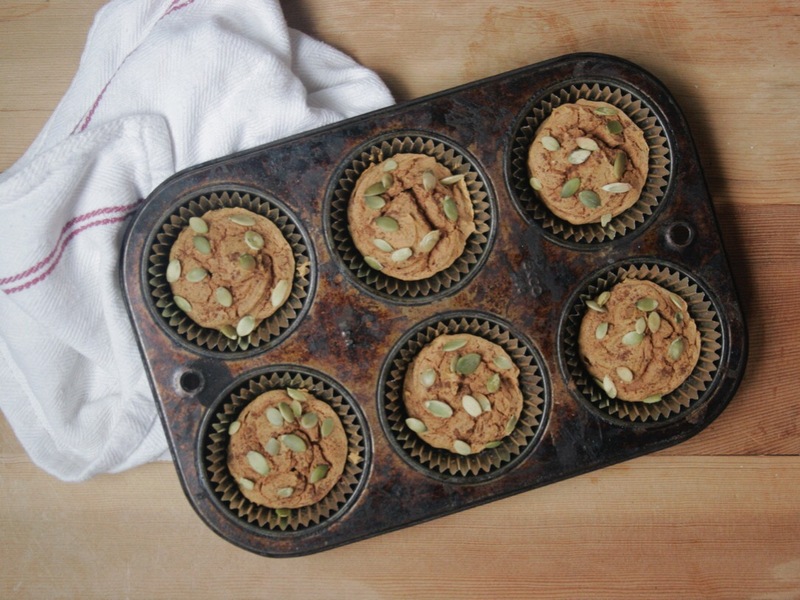 Sprinkle the tops of each muffin with a little bit more ground cinnamon and raw pepitas. Bake in the oven for 20-23 minutes or until fully set and lightly browned. It will be hard to see the color due to the spices and the pumpkin in the batter. If a toothpick inserted into a muffin comes out cleanly, they are done. Let them cool before eating. They can be stored in an airtight container for up to 3 days and can be eaten at any time of the day. Tip: Serve these up with some lightly salted yogurt for a really great breakfast or brunch! All you need is 1 sugar pie pumpkin. These small, round pumpkins are naturally sweeter and less starchy and stringy than their more common carving counterparts. Please be polite and wash your pumpkin then preheat your oven to 325F. Line a baking sheet with foil and set aside. Start by cutting the stem off and cut the pumpkin in half from top (where the stem was) to bottom. Then, take a large metal kitchen spoon and scrape out all of the seed and stringy flesh. Save you seeds! You can set those aside and make pumpkin seeds later. Try this recipe here. I just add oil to mine, no salt, and then I can add them to salads or have a nice little snack. Once all of the seeds and pulp have been removed simply place the pumpkin halves cut-side down on the prepared baking sheet to lock in the natural juices and prevent yourself from having to use oil or butter. Bake the pumpkin in the oven for 1 hour or until the skin starts to look a bit leathery, wrinkly and starts becoming removed from the pumpkin meat. That’s all there is to it. These little treats aren’t limited to just breakfast but as a snack on their own or with a complimentary meal. This recipe really reminded me to have some fun with spices and let go, and I enjoyed every moment of it!